It's always an uphill battle when you strike gold on your first try, yet that's precisely what happened to indie-rock group ON AN ON: within two months of the release for "Ghosts," the newly-formed band's first release, the song had been streamed upwards of 250,000 times. The unexpected success of the song, however, makes it a potentially ballsy choice to kick off ON AN ON's debut release. After all, getting an audience is only half the battle--it's getting it to stay that can make or break a band. If Give In is any indication, however, this group has far more up its sleeve. With one of the most solid debuts of 2013's first quarter, ON AN ON expands that first moment into a bold, poignant statement, proving it's a force to be contended with. 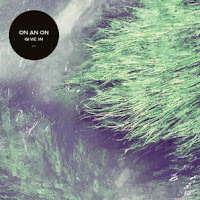 Fitting for its title, Give In is nothing less than irresistible right out of the gate: "Ghosts," for all its slightly morbid reflections on sincerity, wraps those sentiments in a blanket of gentle acoustics and electronics. The track's also a primer on the vocal stylings of Mr. Nate Eiesland, who sharpens the emotional edge of his oblique but honest lyrics with his charmingly understated approach, a breath of fresh air from the more theatrical stylings of contemporary indie-pop (as much as I love you, Nate Ruess, I don't need ten more guys who sing like you on my local radio station). As it settles in, ON AN ON begins the task of welding its uniquely dark perspective into a broader set of influences--it's not often we get music that's frosty and uplifting at the same time, but the concoctions the band comes up with have a charm all their own. The band derives much of its power from its incredible percussion: just as we finish "Ghosts," a crackle of mathematical handclaps creates a ground on which "Every Song In The World" takes off. Eiseland's plantive requests are backed with a beat infused with hip-hop and electronica, bolstering the force of his subdued croon tenfold while giving the squiggles of synthesizer and bass something to grab onto. "American Dream" takes folk motifs before pushing them into pop constructs, spinning a vague promise into something tangible. "The Hunter" does much the same, finding the humanity in its vocoder-heavy melody in what surrounds it: layers of soaring brass and throbbing bass baked into bombastic rhythms. Arguably the highlight of Give In's first movement, it takes an individual's determination and turns it into a beatific celebration for all. ON AN ON's true strength is how it finds its power in the little moments, the ones we all secretly harbor but bristle at showing; in the world of Give In, melancholy is camaraderie. Unfortunately, the middle third of Give In dips slightly from its jubilant opening: it's the sound of a band putting the pieces together and not quite getting a perfect fit each time. The band straddles an at-time uneasy line between introspective, lyrical beauty and hazily sketched instrumental tangents that wavers a little in the middle: the subdued "All The Horses," for example, bubbles with texture in its first half but loses steam once it enters a meandering synth-driven coda, too busy to provide space for introspection but not loud enough to reach a recognizable climax. "Bad Mythology" regains momentum by charging forward, split between a saturation-drenched beat, a psychedelic guitar melody that serves as a wordless chorus, and Eiesland's winsome vocals. Strangely, though, it doesn't work quite as well as the other percussion-driven tracks, perhaps because there's no build to anything. The song is there, it's gone, and though Eiesland makes conjectures about "which heart is yours," he doesn't quite get a firm enough grasp on ours. Of the strange trio of tracks in the middle of Give In, the simple and charmingly folksy "War Is Gone" is the best. Though a touch more subdued than ON AN ON's finest moments, it knows where it's going and wastes no time in getting there. That said, all three tracks demonstrate potential in bits and spurts, and while ON AN ON may be confused from time to time, "boring" is not a word in the band's lexicon. Even better, by the time Give In enters its third act, the band pulls its disparate pieces together in a remarkable run to the finish line. "Cops" finds a more subdued way into the heartstrings, its six-minute running time allowing it to create one of the most cohesive stories to be found here. "Panic," meanwhile, is a surprisingly fierce bite of rock from a band that for the most part sounds like it's been prescribed an especially strong dose of Lunesta. The two tracks couldn't be more different, but ON AN ON execute both with efficiency and a invigorating confidence that seeps into the music. That said, it's on "I Wanted To Say More," the album's closing statement, where ON AN ON truly proves its mettle: the eight-minute epic is an absolute force of nature and the band's most breathtaking work to date. Eiesland's voice is at its most devastatingly raw, buried under foggy, detached production that only brings out his fragile timbre's most haunting qualities. In just a few words, he exemplifies the emotional conflicts at the center of the entire album. He closes out his lonely ruminations with a plea: "Don't leave me 'til you get back / This is just what I need." No sooner does he finish than the album plays its trump card, a gorgeous epilogue built on guitar strums, drizzles of piano, the distant thundering of robotic synths, and shards of voices distorted beyond recognition. If there's any lingering doubt about ON AN ON's abilities to handle its vast instrumental prowess, this should extinguish it. The experience is akin to looking out your window and seeing a typhoon in the distance: though you're safe in your home, you can still feel the winds raging in your bones. The closer is expertly crafted and chillingly atmospheric, a perfect summation of a band with a knack for expertly crafted and chillingly atmospheric music. And considering the overall depth, power, and scope of Give In, it's safe to say ON AN ON has far more to say in the near future.